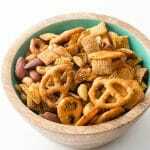 Classic crunchy, savory party mix updated: Slow Cooker Gluten-Free Chex Party Mix! 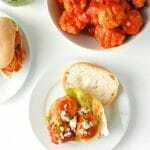 Easily available ingredients and a party appetizer everyone can eat! With gluten option. Long weekends and holiday breaks always seem to demand more snack options. If we get involved with lengthy game playing (Catan is a family favorite and can go on for hours) or movie marathons, grazing rather than meal-eating seems to take over. 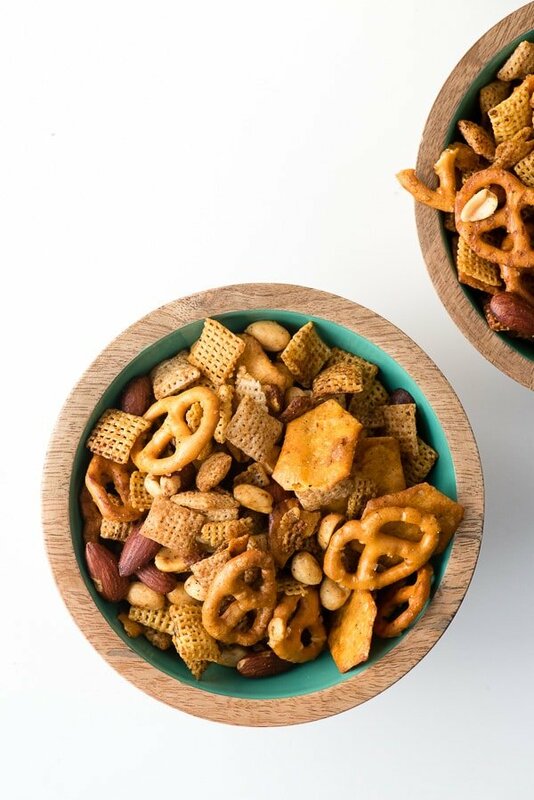 Today’s recipe is a tried-and-true party favorite but I’ve made it totally gluten-free: Slow Cooker Gluten-free Chex Party Mix. 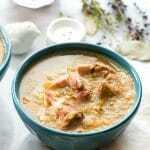 I love almost anything I can do in my slow cooker for a few reasons. 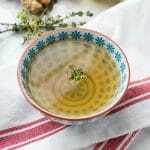 It usually allows fixing and forgetting it, such as with soups. 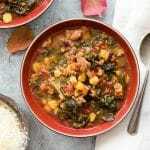 The ingredients can be loaded into the slow cooker and left on their own to cook for hours yielding a tasty prepared dish. Using the slow cooker also leaves the oven open for other recipes to be cooked. In the summer, it accomplishes the same end result as using the stove top or oven without heating up the kitchen (for the recipes appropriate for the slow cooker). 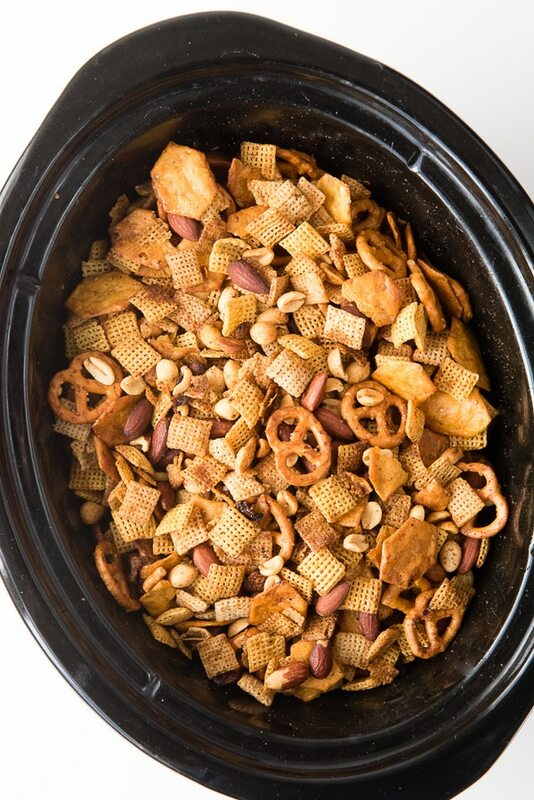 Slow Cooker Gluten-Free Chex Party Mix is no different. It cooks well in a slow cooker and to me is easier than trying to stir the recipe on a baking sheet in the oven. My husband remarked that having to stir (really rotating the party mix from the bottom of the slow cooker insert to the top) the party mix would seem to negate the value of making it in the slow cooker versus the oven. I still love the containment of having it in the slow cooker and keeping the oven free for other pursuits. 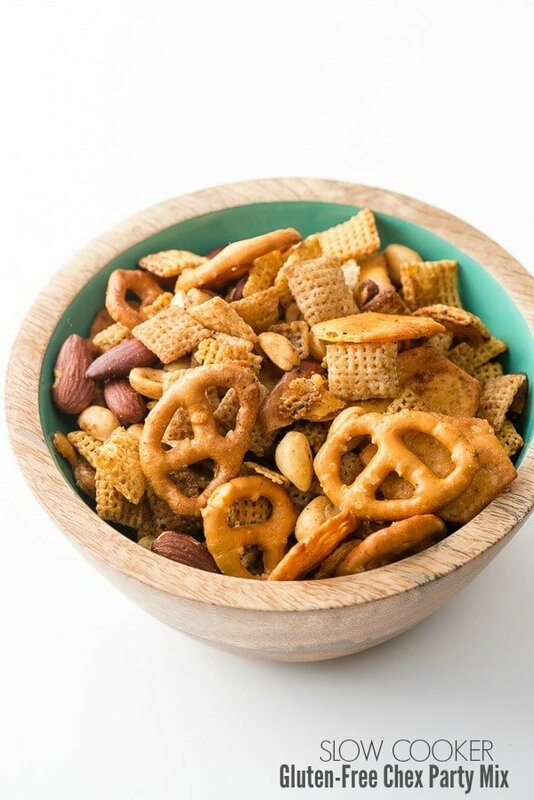 I feel so fortunate many mainstream companies have jumped on board the gluten-free bandwagon so classics like Chex party mix is something everyone can now make and eat. There are multiple versions of the party mix but I stuck to what I love in the ingredients and fortunately it was easy to find the ingredients I wanted to use in gluten-free form. 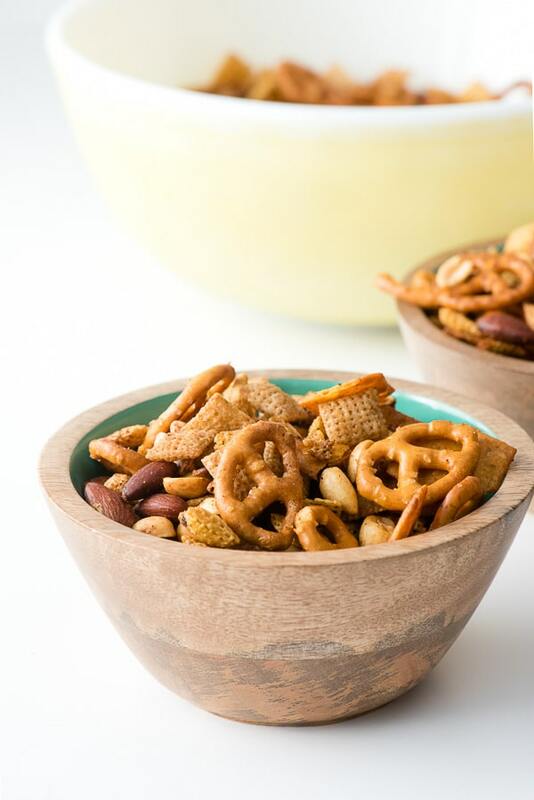 This Slow Cooker Gluten-Free Chex Party Mix uses two types of Chex (rice and corn), pretzels, cheese crackers, cocktail peanuts, smoked almonds with the savory seasonings we know and love. I know some versions use small bagel chips too which are also available in gluten-free form. And guess what gluten-eaters? You can substitute equivalent gluten alternatives if you wish to. I believe all Chex cereals are gluten-free now (not gluten version) so the pretzels and cheese crackers are the only ingredients that you’d swap out. My preferred way to cook the mix is on low temperature with three layers of paper towels between the lid and the slow cooker insert. This absorbs some of the condensation while it cooks. Even so, if you sample the ingredients while the mix is cooking you may find the consistency to have become soft (I did with one of the Chex types and the cheese crackers). Never fear however because as soon as the lid is removed and when the mix cools everything will become crunchy again! This classic party mix is changed up by both cooking it in the slow cooker instead of the oven and all the ingredients are gluten-fee. It's easy to prepare and perfect to have on hand for snacking or entertaining.For those wishing to make a GLUTEN version: substitute gluten cheese crackers and pretzels. All other ingredients are naturally gluten-free. Spray the insert of a 6 quart slow cooker with non-stick spray. Add the Chex, crackers, pretzels, almonds, peanuts and stir to mix together. Combine the melted butter, Worcestershire sauce, paprika and garlic powder; whisk to combine. Pour over the dry ingredients in the slow cooker and mix to fully coat. Place three layers of paper towels between the top of the slow cooker and the lid (the paper towels will extend outside the slow cooker opening). Cook on LOW for 1 1/2 hours, stirring the ingredients from the bottom of the slow cooker up every 30 minutes to prevent burning. After 1 1/2 hours remove the lid and paper towel and cook for an additional 20 minutes, stirring as needed to prevent burning and to combine the ingredients. Remove from the slow cooker and spoon onto a couple of baking sheets or parchment paper on a countertop to cool fully before serving. Hurrah! Tis the season. This is the time of year we make a Chex mix. This sounds great! This looks like the perfect snack for the kids! They love check mix cereal and i love that its gluten free. We are always on the go so my slow cooker is my bff. I need to bench out and try more recipes. I use it mainly for meat or soups. Never tried it for a party mix, but this Chex mix sounds awesome! This party mix is right up my alley! I love the variety and the healthy side of it, easy to do and recommend! I love that Chex has so may gluten-free options. This mix sounds delicious! I just love your gluten free recipes! I am so making this for my son! 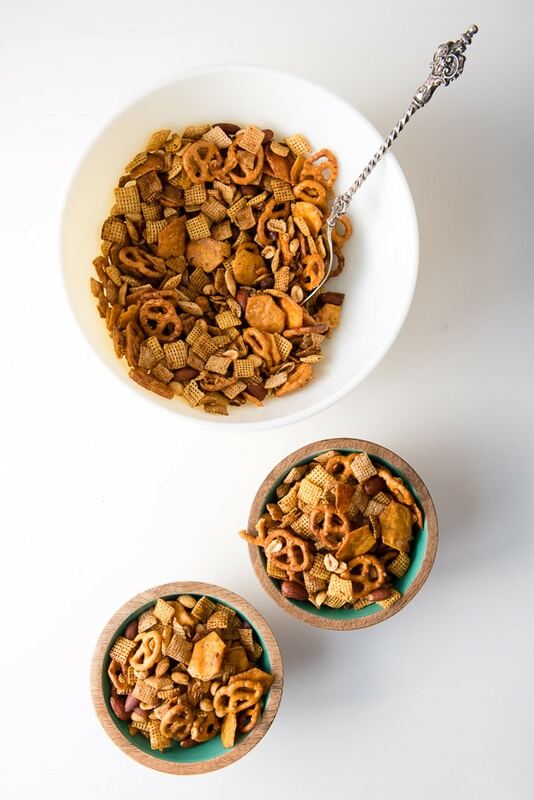 We love Chex mix and especially creating our own unique recipes with it and now that our gluten free family members can also indulge in it makes me so happy! Thanks for sharing! This looks so delicious. I have never made my own Chex Mix before but this looks easy enough.